For Download Version, scroll down to end of description. We should be instruments of God's Mercy and Compassion upon Mother Earth every day, not just on Earth Day, not just during the Wesak Festival. Due to the overwhelming demand for a meditation that focuses on blessing and alleviating earth changes and natural calamities, Master Co facilitated this meditation online in March 2010. 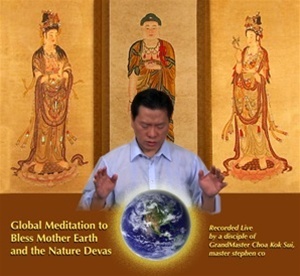 Because of the continued need for this meditation, it has been turned into a DVD so that we can spread the meditation and continue to alleviate the Earth's suffering. Please join us in doing this meditation at least once a week to bless the nature devas/spirits in charge of the air, the ground and the waters with peace, love and calmness. In this powerful meditation, we affirm our Oneness with God and Oneness with All so we can be utilized as a huge channel for the Blessings to pour through to the areas that have earthquakes, storms, floods and volcanic eruptions. As we do the meditation, please make a firm resolution that we as God's Instruments willingly and gratefully participate in the Blessing of our Beloved Mother Earth, the Nature Devas and our Spiritual Brothers and Sisters. This meditation can also be downloaded for only $9 USD. This purchase, will send you an email with a link to your download. The link is valid for only 72 hours and for 2 downloads. To purchase DOWNLOAD ONLY click "Add to Cart" Button.